Have you ever kissed a fish? 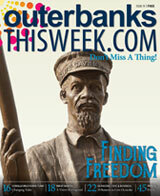 Chances are the answer is yes for those of us who have been aboard the fishing head boat Miss Oregon Inlet. 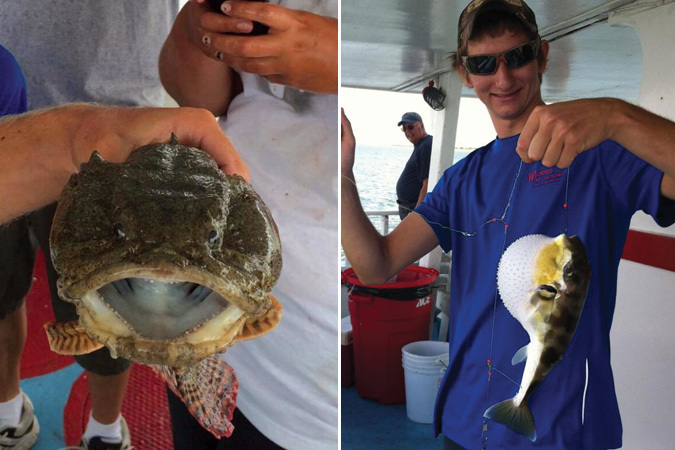 The captain and mates will tell you that it’s bad luck not to kiss the first fish you catch, but for anyone who is a little squeamish … don’t worry. It’s all in good fun! 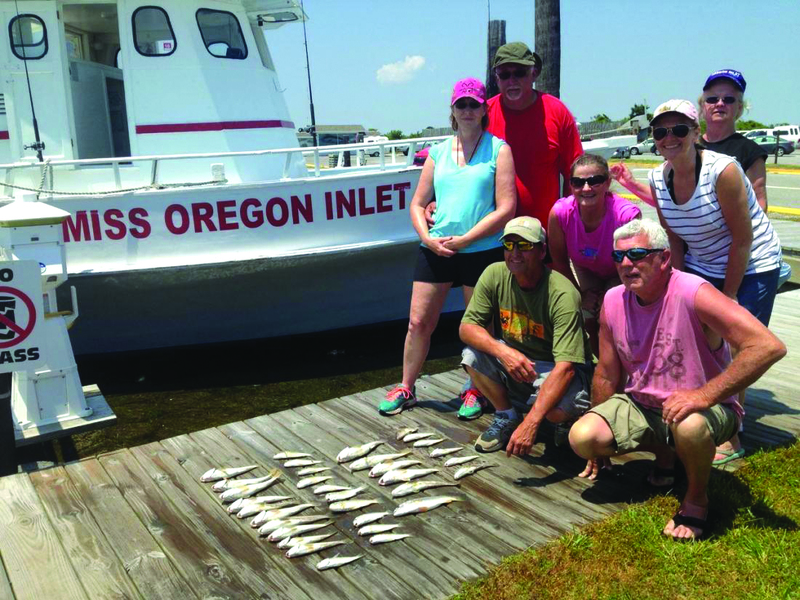 Beginning fishermen and experienced anglers alike are welcome aboard Miss Oregon Inlet, a 65-foot, red and white head boat that was the first of its kind in Oregon Inlet some 30 years ago. She’s not called a head boat because she is one of the larger boats docked in the inlet, as some might believe, but because passengers can book fishing trips per head (per person) instead of paying for an entire boat to go out with only their party. And one of the best parts about head boat-style fishing, besides actually catching the fish, is the chance to meet new people because you never know just who you’ll be sitting next to. The Miss Oregon Inlet crew, led by Captain Randy Frees, will set you up with all the bait and tackle you need for a half day of fishing in the inlet and its surrounding waters. All ages are welcome, especially kids. First mate and relief captain John Booth will say with a smile, “We aren’t a bad babysitting service. We love to take kids who’ve never been fishing and teach them to be self-sufficient by the time they leave the boat.” And that includes both the kids who want to get their hands on a fish and those who prefer not to touch! Some of those usual suspects might include spot, croaker, flounder and bluefish, and then there are the unexpected finds like squid and lost fishing rods. But one thing is certain. Young anglers are sure to be familiar with Georgie the pigfish by the end of any fishing excursion. According to Booth, Georgie is his pet fish and is trained to bite hooks on slow fishing days. Pigfish are one of the most common types of fish caught on the head boat, so Georgie is likely to make an appearance even when other fish are scarce. Sometimes kids will even catch Georgie several times in one day! Besides offering a more than memorable fishing experience, a cruise on Miss Oregon Inlet has been known to turn into a bird or dolphin watching trip with pelicans roosting on a nearby island and porpoises regularly coming out to play alongside boats in the inlet. You may also see ospreys, turtles and the occasional parasailer drifting by. The ride is always smooth – in fact, the crew often refers to the head boat as a fishing pier that can move because it is so gentle and stable on the water, but unlike an actual fishing pier, it can motor to where the fish are biting. 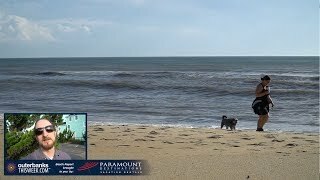 Before you leave the boat, make sure to sit down with Booth and ask him about his grandfather’s grandfather who was shipwrecked on the Outer Banks in 1803. Booth is both a local waterman and a history buff, and he loves sharing his stories with the people he meets on Miss Oregon Inlet. At the end of the trip, Booth and the rest of the Miss Oregon Inlet crew will encourage you to take home your catch (and the ones they’ve allowed you to keep all meet size regulations – for example, a sea bass needs to be 12 inches long in order to keep). And if you don’t take home your fish, the crew will. You can have your fish cleaned at Oregon Inlet Fishing Center for a small fee, and some local restaurants are even willing to fry them up for you if you call ahead. Keep an eye out for the charity events held on Miss Oregon Inlet, including a day in late summer where all proceeds are donated to a local children’s charity. There is also a free fishing trip for the visually impaired organized by the Lion’s Club – a tradition that began in Miss Oregon Inlet’s first year. Miss Oregon Inlet departs twice daily in the summertime at 7 a.m. and noon, and from Labor Day through October 31, the head boat will run one trip at 8 a.m. with no fishing ever on Sundays. Passengers are welcome to bring coolers of soft drinks or beer and wine for their trip and will appreciate the restrooms located in the cabin. The boat is also available for special events such as weddings and private boat rides. Whether you are catching fish, kissing fish or both, it’s sure to be a great time aboard Miss Oregon Inlet.